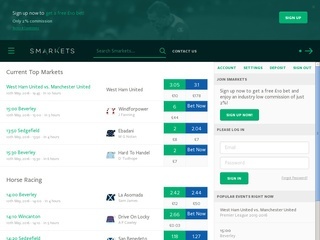 Smarkets is an online betting exchange. It was founded back in 2008 and Launched in 2009. It bases its operations in Finsbury Square, London. The website markets itself as an alternative to Betfair, its bigger competitor. Taking into account Smarkets is not considered a bookmaker, but a betting exchange, all of the bettings are peer-to-peer based. Traders are allowed to bargain and agree on odds amongst themselves. This particular online betting platform capitalizes on engineering and speed, making it an excellent experience for anyone who wishes to bet. And this is exactly one of the reasons Smarkets was named, back in 2012, in the Startups 100 awards as one of the most innovative and ground-shaking new companies in the United Kingdom. Smarkets does not limit your bets to sports. The bookie has options for political betting, current affairs, popular culture and, of course, sports. The variety of topics to bet on renders Smarkets an amazing place for recreational online betting. The betting exchange is operating under a license, issued by Malta Gaming Authority. Sadly, the Smarkets platform is not as popular as Betfair yet, but it is slowly climbing its way through the ranks. Nevertheless, it offers a nice alternative and using this website is a good change of pace, due to the great interface. Smarkets is one of the 2000 most visited websites in the UK. The majority of the players are also from the United Kingdom, followed by India and Germany. Smarkets is one of the online betting websites, which allow their clients to bet on a variety of sports. This particular online bookmaker covers a nifty number of sports – Football, Horse Racing, Golf, Cricket, Tennis, Basketball, Rugby, Baseball, American Football, Motorsports and Ice Hockey. Aside from sports, politics and current affairs are a great place to test your forecasts. The minimum bet on Smarkets is EUR 0.05. The maximum bet is variable between the events. The good thing is, there is no maximum on the winnings. Smarkets takes a flat 2% commission from players. The bookie offers Live betting with a handful of options. Since this is a betting exchange, you match your wits against other players, not against the bookmaker. Players can set and bet on their own odds. As for the betting options, the players can net their money on a large array of variants. The usual ones are Winner, Half-time, Full-time, Correct score, Mon and Val score and a few more. Smarkets supports both PC and mobile versions. When accessing the online betting platform from your phone, you will notice the interface is very smooth and intuitive. Their focus on engineering and user experience has come a long way throughout the years. Be prepared – your winnings depend on your analysis skills and not on luck. Smarkets online bookmaker employs some very helpful professionals. You can contact them through e-mail, Twitter, live chat, by post and by phone. The hotline services customers from 09:00 to 19:00 every day. The website uses SSL and TLS encryption protocols. What this means is, that your data, names and fund information will be safe. Call or write to the team when you are in need! They will be glad to assist you and resolve the issue, or answer your questions. They only support The English language. They hold the players’ funds in separate, dedicated accounts. These funds do not fall under any insurance or guarantee, thus if the company becomes insolvent, your funds will be unprotected. According to the UK Gambling Commission rating categories, Smarkets falls into the Basic level of fund protection. Smarkets allows its clients to deposit and withdraw funds from several channels. The most common ways are through Visa and Mastercard. Both credit and debit cards are supported. Aside from the default ways, you can use e-wallets. The third payment method is the bank transfer. When depositing, everything is free of charge, except for the Visa and MasterCard credit cards. They take 2.5% of the transactions. Withdrawals are free, except for the bank transfer method. The fee is usually the equivalent of 10 GBP or 12 EUR. It’s only free for Euro transfers within Europe. As of the time of writing this review, Smarkets betting exchange does not offer any loyalty programs. Don’t let this make you look away from the website. As mentioned, you are playing against other players, not a bookmaker. You can achieve big wins if your guesses and systems are better than those of the majority of the user base! Smarkets do, however, have an affiliate program in place. It has been polished and made very user-friendly throughout the years. With this program, you get 25% of all the commissions earned by your referent. There are no minimum targets and all the earnings are transferred directly to your Smarkets account at the beginning of every month. The best part is that you keep earning as long as the people you referred actively keep betting. There is also a small deposit bonus for new users. If you deposit 20 GBP/EUR (or the equivalent sum of other currencies), you get 50% of the sum for free. The offer is static, so if you deposit more the first time, you still get half of the minimum value. It’s not much, but it’s a good welcome gift for new players.